A while back I bought a 22 x 26 sheet of Fabriano Tiziano in beautiful aqua color. I tore into smaller sizes and have slowly but surely been tangling on them. I’ve only got a few pieces left before I’ll be finished and will then sew them into a book. 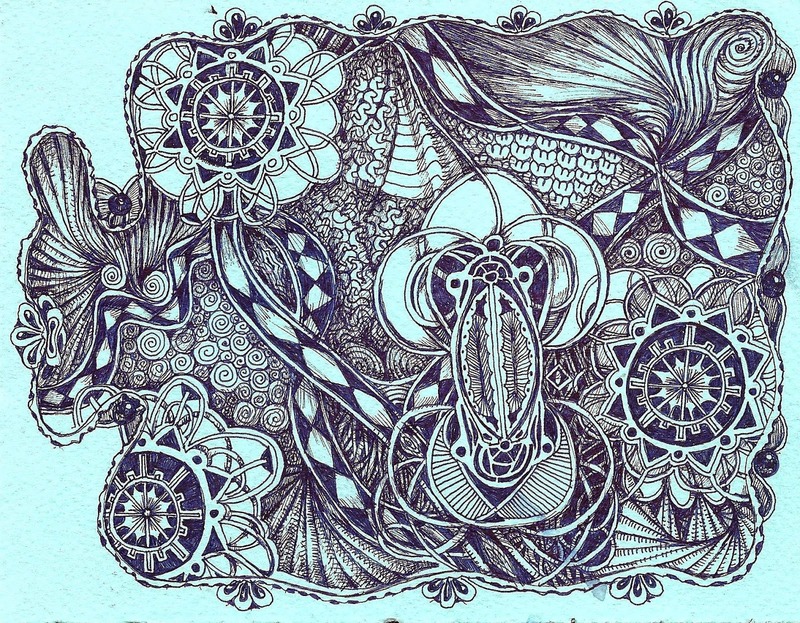 This one was drawn using a 0.4 Hi-Tec-C Maica pen in blue-black. I love these pens. They are a hard-tipped gel ink pen. The ink flows more steadily than you find with many gel ink pens. They aren’t water-proof–in fact, you can make glorious watercolors with them, but, as you can see here, they work beautifully for line work.